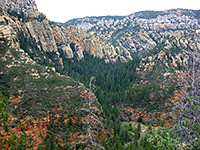 A few miles north of Sedona, the two sides of Oak Creek Canyon are rather different in character - the western cliffs are somewhat less steep, have more exposed rocks and are split by many ravines, mostly very short, while the east face is steeper, more forested and more uniform; mostly a straight slope with no major drainages until Casner Canyon, quite far south. Partly because of the steepness there are only three trails from the valley floor to the eastern rim, and of these, the most used is the Thomas Point Trail, which starts from the same trailhead as used for the West Fork of Oak Creek, though even this is quite lightly traveled. The route is short (one mile), and despite gaining nearly 1,000 feet, the round trip takes only an hour or so. 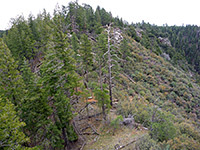 The first section is through woodland, but the majority of the upper part crosses open, sandstone slopes, giving good views south over the main canyon, and west, all areas affected by the 2014 Slide Fire. The path ends in wooded surrounds once more, on the rim, where gaps in the trees allow equally good views north, past the upper end of the canyon towards the San Francisco Peaks near Flagstaff. Parking for the Thomas Point Trail is at the busy West Fork trailhead (Call of the Canyon), which in spring and summer often fills up by 11 am, even on weekdays. A charge of $10 per vehicle is levied, paid to an attendant who arrives at about 8 am, and the fee allows entry to this area only, not any other of the sites elsewhere in Oak Creek Canyon. The West Fork Trail starts on the west side of the parking area, while the narrow path to Thomas Point is south, marked by an inconspicuous sign. 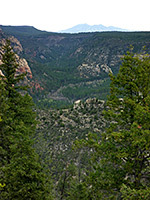 This location is 10 miles from Sedona and 19 miles from Flagstaff. The official Thomas Point trailhead is on the east side of US 89A, 1,000 feet south of the entrance to the West Fork parking area; the access route is via a narrow path that crosses an apple orchard and climbs a grassy bank to the highway, and then along the verge for about 300 feet, just past the first house on the right (west side), where the rusty trailhead sign can be seen on the opposite side of the road, at the edge of the forest. From here, the path climbs a little then moves south, up more gradually to an unsigned junction, straight on being an alternative approach, leading back down to the road. Turning left (east), the main trail ascends more earnestly via a few switchbacks, crosses a steeply sloping drainage and then heads south, becoming fairly level. 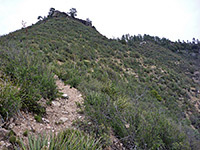 The pine trees start to give way to shrubs and yucca, and soon stop completely, as the trail traverses an exposed hillside of white Coconino sandstone, good habitat for many types of wildflowers. The views south are quite extensive now, along two miles of Oak Creek Canyon, which in this upper part is still relatively thickly forested, with red rocks only exposed in a small area some way downstream. 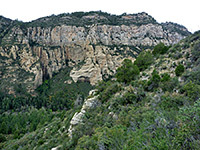 The path moves round the hillside, away from the main canyon briefly, above a side ravine (Surveyor Canyon), then transfers back west, where the white rocks underfoot give way abruptly to reddish earth of the Toroweap Formation, more bushy and overgrown, with manzanita and scrub oak. The vegetation encroaches closely on both sides, and the surface is steep and slippery. The last climb leads back into woodland, on the canyon rim, and the trail ends at a flat area with trees all around, hence the views are more limited. Another short path links with a forest track a little way east. 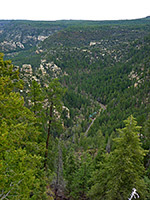 Better views are from the top of a rocky outcrop just to the west, where both the north and south sections of the canyon can be seen.